I treat a lot of swimmers with the local aquatics club. The level of competition is fierce. They swim 6 days a week, often more than once a day with only 2 weeks off per year. With these high level swimmers occasionally exceeding 20,000 meters per day in training, overuse injuries frequently occur. Greater mobility in some joints allows for kicking and recovery movements without disturbing body alignment therefore allowing for a more streamlined swim with less turbulence. Greater mobility in certain joints allows for the propulsive force to be sustained over a longer time. Greater flexibility may reduce energy expenditure and improve speed by decreasing intramuscular resistance. Flexibility exercises for swimmers should concentrate on stretching the connective tissues of the muscles, but not the tendons and ligaments. Sprains and tears can result from ligaments and joint capsular structures being stretched beyond their normal extensibility. Swimmers should only stretch to the point where resistance is felt. Stretching exercises for swimmers that should be avoided are those assisted by a team mate that stretch arms up and forward from behind the back, and those stretches that force the shoulders back at shoulder level. Both of these stretches force the head of the humerus (long arm bone) forward against the tendons and ligaments that become chronically inflamed in swimmers when they develop tendonitis. It is therefore best to avoid stretching exercises for swimmers that would exacerbate that condition. Other exercises for swimmers that involve dangerous stretching are stretches to the knees and hips. Although flexibility in these joints is definitely an advantage in breaststroke, the potential for long term harm is too great for me to recommend them. I often encourage my patients to take up swimming or aquafit classes. Movement in the pool is excellent for aiding recovery. The bouyancy of the water relieves pressure on joints that are normally weight bearing and adversely affected by high impact exercises. When one is immersed to waist level your weight is effectively reduced by half. When immersed to the chest this is reduced to 25%. When immersed to the neck, you effectively weigh 10% of what you weigh on land. This makes swimming the ideal exercise for those suffering from arthritis, obesity, or fibromyalgia. Swimming will improve your muscular strength, improve activity tolerance and endurance, posture, flexibility, and cardiovascular fitness. Swimming is also an effective weight loss adjuvant. Swimming at a medium intensity can burn 200 calories in half an hour. Swimming will give you a whole body workout as it uses all major muscle groups. Water provides resistance to all movement so increases the work done in the water. The sensation of weightlessness, the rhythm of the stroke and the sensation of the water can be almost meditative and relaxing. It is a great way to deal with stress. The increased humidity in the air above the water aids those that suffer from exercise induced asthma. A study by the NSW Asthma Foundation found that of 73 children that entered a swimming program, half of them were able to reduce the type or amount of medication they required. Swimming's a good method of recovery after long training sessions. Swimming can be a light activity to promote recovery and stimulate blood circulation. Swimming encourages flexibility. Exercises such as running and bicycling compress the spine; whereas, swimming encourages you to lengthen the body. Prior to taking up swimming you should consult your family doctor. Conditions such as epilepsy other others that may cause fainting or dizziness should be discussed with your family physician. Otherwise, swimming is an excellent activity for those that have difficulty with land based or high impact exercises. Buoyancy of the water relieves pressure on joints and the humidity of the air aids those that suffer from exercise induced asthma. There are swimming exercises you can do to help your technique, but it is difficult to do this on your own. A swimming instructor can give you feedback and one on one advice. If you are consistently performing well during training but it's not carrying over into better times at swim meets you may be looking at a psychological barrier. You may be holding back to protect your ego. At the end of a race you should be able to say you gave it your all and realize that winning at the swim meet shouldn't determine whether or not you feel bad, but rather about swimming your hardest and knowing you did your best. Keep your attention in your own lane and don't worry about what your competitors are doing. The more you think about what your neighbour is doing the more nervous you will become and that will affect your time. Think about what you are feeling as you move through the water - how much you are pulling, how much roll, etc. rather than "I've got to go faster". Stay focussed on what you are doing at the moment. Don't dwell on past times or focus too much on future goals. Aquire the discipline to recognize when you lose your focus and immediately bring it back. Staying calm is the secret to performing your best, so try and have fun. Don't worry about pleasing mom or dad or your coach. This performance anxiety will cause you to tense up. If you keep doing the same thing you will keep getting the same results. Ask your coach if there is something you can change. When swimming in a public pool there are often rules that assist in the free flow of swimmers. Pools will often have lanes dedicated to faster swimmers and directions posted. If you are swimming and catch up to the swimmer in front of you allow them to pull aside and let you pass. Shoulder stretching is well documented in the literature as a method to improve performance and prevent injury in swimming. As such swim coaches and the swimmers devote a lot of time to stretching. Doing drills during a few of your lengths will help improve your stroke. For instance, using a flutter board to work on kicking. By improving your stroke you will improve your swimming efficiency. You will be able to swim the same distance with few strokes and in a shorter period of time. Do a few lengths at a slow pace to allow your muscles to get used to the movement and warm them up. This will help prevent injuries. Studies have shown that an active warm up (as opposed to sitting in a warm room for a warm up) will improve your times more than a passive warm up for your first swim event. An active warm up brings oxygen and nutrients to the muscles and improves nerve conduction. A period of active recovery has been shown to result in better performance in subsequent events. Studies have found that swimming after your meet at a pace equal to your lactate threshold is better than swimming around lazily and better than just sitting. You can determine your lactate threshold roughly by estimating how fast you think you could swim comfortably for an hour. Stretching during a warm down also helps the muscles relax before the next race. You can improve your stamina by training in sets. Swim a given number of lengths and then take a 30 second break. Increase your stamina by gradually increasing the number of lengths in each set. By using a variety of different strokes you will use more muscle groups and minimize the repetitive stresses on the rotator cuff. While most people are very keen to begin a new exercise program, like any new activity it is best to start slowly. You can set goals for the distance you would like to achieve, or the time you would like to swim a given distance. In the beginning it may be realistic to set the goal of just getting to the pool twice a week. Correct stretching is only one part of preventing and treating injuries in a swimmer. The purpose of stretching prior to a swim is to obtain full range in the joints. Muscle may become tight between swim workouts and it is important to ensure you have full range prior to any swimming. Even small restrictions in a joint can lead to injury while swimming due to the repetitive nature of the activity. Stretching after the swimming workout is of course also important to increase flexibility. Stretching exercises for swimmers should address pain from delayed onset muscle soreness and muscle imbalances. Care should be taken, however to avoid over stretching the joint capsule leading to hypermobility and impingement. Stretches should be included for the pectoral muscles, neck muscles. and latisimus dorsi. Stand or sit with chest up and head in neutral position. Put your right hand up on the wall overhead, thumb facing up. Slowly rotate your trunk to the left until stretch is felt. Stand facing a wall or pole about three feet back. Put both hands on the wall as high as you can reach, one hand on the other. Let your chest sag toward the floor while maintaining your hand position. Standing, grasp your right ankle with your right or left hand behind you. Pull your foot up and your knee back. Stand and face a chair or table. Put your foot up on the chair. Keep your heel on the ground and lean forward with your right knee straight. Rotating the toes in and out slightly will target the medial and lateral parts of this muscle separately. Stand away from a wall and put your right foot behind you and be sure your toes are facing forward. Lean forward at the ankle while bending the right knee and keeping your heel on the ground. Because the knee is flexed, tension is taken off the gastrocnemius and placed on the soleus. Repeat both of the above on the left side. To stretch the right hip flexors kneel on your right knee and put your left foot in front of you such that your left hip and knee are about 90 degrees. Put a noodle or board on the floor for your knee if you find this uncomfortable. 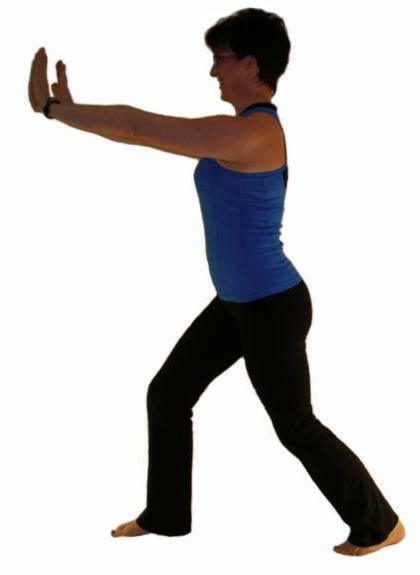 Put your right hand on your right hip and push your right hip forward so that it is in front of your right knee. Kneel onto your left leg or simply squat down on the left. Place your right foot in front of you to assume the lunge position. Try to straighten the right knee and lean your body forward while relaxing your hips. 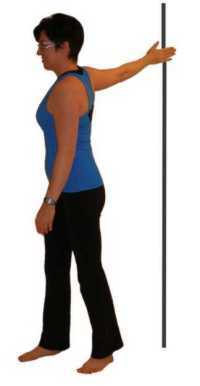 Rocking the hips forward and back will change the pull slightly to get all long adductors. The quickest way to stretch the short adductors is to stretch them both at the same time in sitting. Sit on the floor with feet together, knees bent. Gently apply pressure to your thighs as you lift your chest up and bend forward at your hips. Sit or stand with your chest up and looking straight ahead. Keep your head upright, don't look up or down. Keep eyes facing forward. While holding your chin back with one hand, use your other hand to reach over the top of your head. Stabilize your chin back as you gently pull the top of your head forward. This is a tilting motion. Reach over your head with your right hand. Gently pull your head over to the right side. If you feel pain or pinching on the right side doing this, stop. Your are no longer stretching but stressing joints. See your physical therapist. Gently apply overpressure to your jaw to assist in this movement. If you experience any pain in the neck or jaw, stop and consult your physical therapist.